Oh Meenakshi, kindly bestow me your divine bliss. The dark hued one or one who wears jewels on her limbs. 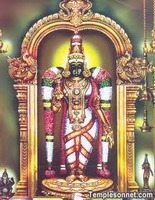 The Queen Goddess, Raja Maathangi. You are also the means of knowledge (maaye). The one whose hue is Emerald. The beloved consort of Shiva. The eyes of Meenakshi are fish shaped. The one who releases all bondages of the world and gives salvation. You are the revered one who dwells in Kadamba forest. The one who dwells in the holy city of Madura (Madurai). Who wears gem studded bangles. The beloved daughter of King Malayadwaja Pandya. The one whose beautiful face outshines the moon. The one who is victorious. 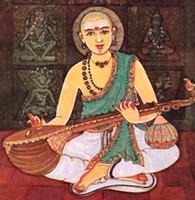 The one who plays ten kinds of Gamakas on the Veena. The one who brings delight to one’s heart which is as sweet as the honey. The one who is very compassionate. Who is dear to Lord Sundharesa. The sister of Vishnu, who is the enemy of demons Madhu and Mura. The one with a slender waist. Who captivates Brahma and Guruguha. She is Shankari, the ever auspicious one. Meenakshi Me Mudham Dhehi is a divine composition by Sri Muthuswami Deekshithar one among the Trinity of Carnatic Music. Deekshithar was a Sri Vidya Upasaka. Worshipper of the Goddess are blessed with brilliance of speech. This song is one of the crowning jewel of Deekshithar’s compositions for various reasons. Deekshithar was staying at Ettayapuram under the Patron of the King. The day before he attained Mukti, one of the Elephant belonging to the King’s cavalry got wild and went havoc. It entered the town and then reached the cremation ground and finally lied there. The King called Deekshithar and asked the implication of this behaviour for his State and Deekshithar assured, “Nothing will happen to you, the public and for the Kingdom and not to worry over the incident”. The next day was Deepavali i.e. Naraka Chathurdasi day and the day was October 21, 1835. Muthuswami Dikshitar woke up in the early hours as was his practice and after yogic practices went to take his bath. He had a vision of Kasi Annapoorneswari. Even as he was gazing on it the vision vanished. Deekshithar remembered what Chidambayara Yogi his Guru had told him at Kasi “She will give you not merely feed in this life but moksha thereafter”. Deekshithar felt his end was nearing. He performed Navavarna Pooja to the Devi and sang the Krithi “Ehi Annapoorne”. After the pooja, he called upon all his disciples and asked them render the Krithi "Meenakshi Me Mudham Dhehi" in the Raga "Gamakakriya". When the Sishyas rendered the Anupallavi line "Meeena Lochani Paasha Mochani", meaning the one whose eyes are in the shape of a fish and the one who removes the bondages of the world and liberates. Deekshithar asked his disciple to repeat the lines “Meena Lochani Paasha Mochani” and shed his mortal coils exclaiming "Shive Pahi”. A memorial was erected over the spot where he was cremated at Ettayapuram. The annual jayanti and aradhana are being celebrated at Ettayapuram at his memorial. We are glad to share the Audio/Video Link sung by Smt M.S. Subbulakshi Amma. The Krithi rendered here by Bharat Ratna Smt M S Subbulakshmi, a native of the temple town of Madurai. In Smt.Gowri Ramnarayan's words "Perhaps it is Subbulakshmi's natural adherence to the composer's vision even while improvising freely on a line from the composition, made her a favourite with lay listeners as well as veteran musicians. Listen to her painting the beauty of Meenakshi, as “Madhurapuri Nilaye”, the deity of Madurai, Subbulakshmi's own hometown." True to those words, Smt MSS takes us on a trip to Madurai, during her neraval at "Madhura Puri Nilaye". This is followed by a brisk round of Swarams. Enjoy the Divine Bliss of Meenakshi!. The divinity of the composition and the melliflous voice of the great singer combine to produce mesmerising effect.! Thanks for the fantastic postings.